Calimayo is a word of Quechua origin meaning “river creature” (“cali”, man and “mayuj”, river), Calimayos are mentioned in native myths as lake creatures from Bolivia and northern Argentina to Patagonia. They are supernatural horses, lake horses. I have mentioned them (and posted an image) in a previous post on Lake Caviahue. In Southern Santa Cruz province, Argentina is Lake Viedma (49°41’ S, 72°00’ W). It is a large -1.088 km2 (420 sq.mi)- body of water, slightly smaller than Lake Argentino into which it flows, and from there into the Atlantic via Santa Cruz River. It is located next to the Southern Ice Field and Viedma Glacier flows into the lake. I heard a long and vigorous galloping close by. They were hoofs that strode on the fine sand of the water’s edge […] I looked out and had the strange impression that it was a black horse of enormous height, it tallness was abnormal […] he sharply twisted his way and ran into the waters, disappearing in the darkness. In the photograph above, Mount FitzRoy (3,405 m - 11,164 ft.) can be seen in the background on the western tip of the lake. At the foot of this imposing mountain is the small village of El Chaltén, "Trekking capital of Argentina". The photograph was taken from the southern side of the lake, in the steppe. 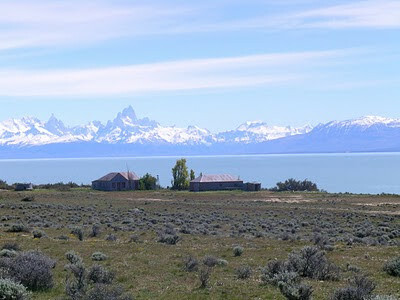 In the foreground are some buildings of a Patagonian "estancia" (ranch). El Guanaco Volador. 2005 Alla por el Viedma Patagonia. 25.09.08. Nuñez, O., L., (2006). Extrañas Marcas en el Cuerpo de una Mujer. Online. Citing: La Razón, Buenos Aires, Argentina. 17.05.1957. More photographs of Lake Viedma. Views of the Viedma Glacier.